I scoured through my photos looking over my silhouette images. Many, I have blogged about before. Most notably, the Sunset of Fire post, and San Diego’s Ocean Beach post. 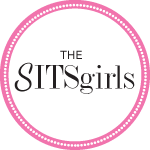 The pictures of silhouettes in those truly make me swoon. But I wanted to feature something different. Something I haven’t displayed before, and not a typical set of sunset, or beach photos (although I love those). That’s when I remembered a time I took photos of some interesting silhouettes at the local park. 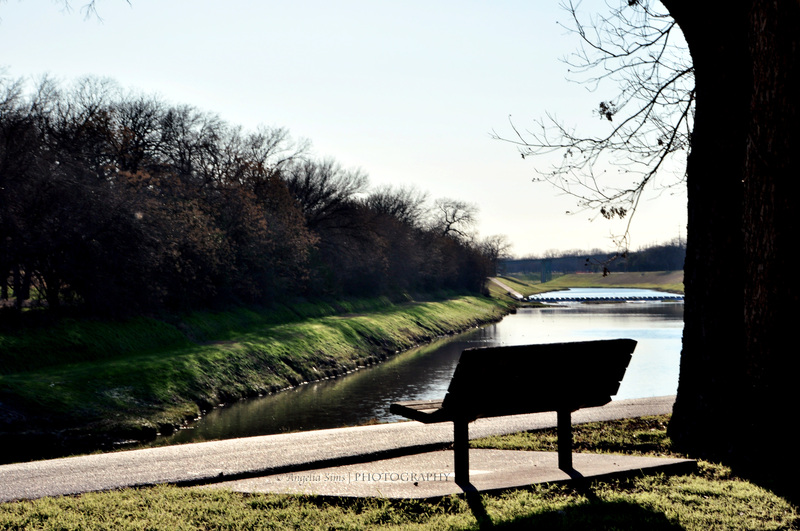 There is a nugget of a nature walk nestled on the West side of Fort Worth, Texas. 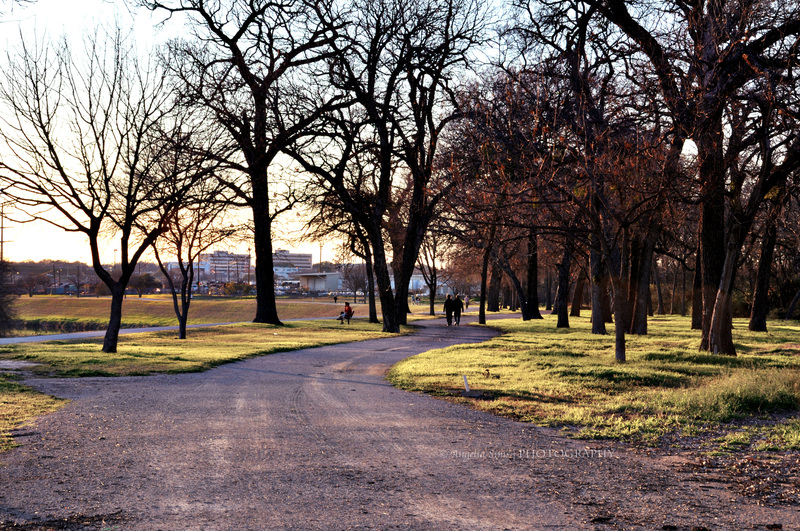 It’s a place known as Trinity Trails. They go all over Fort Worth, but one of my favorite spots is off I-30 and around the University area. I have trained for two half-marathons here and know the markers, and sights, pretty well. But of course, there is always something different to see depending on the season, and time of year. And most especially, when you go with camera in hand, and not a water bottle, and Garmin strapped on. It is a very picturesque park. 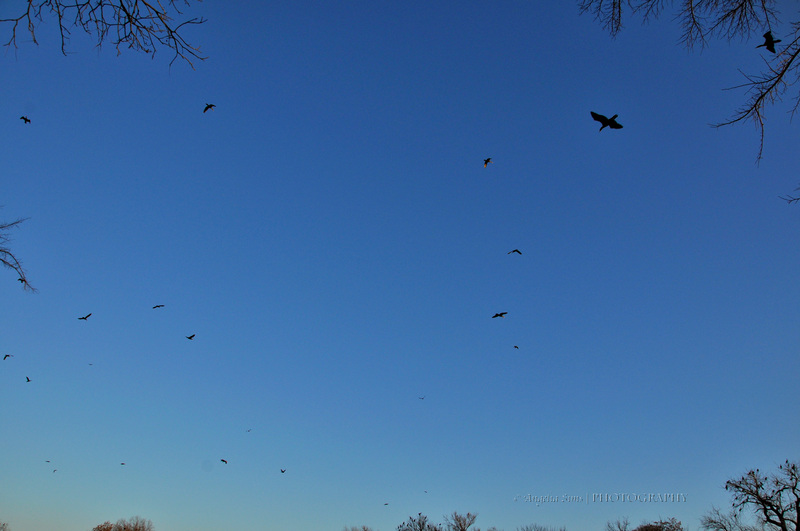 I was adoring this view when I turned to see a crazy display of birds flying overhead. Not just one or two, but a HUGE flock. Then, I noticed something else. These are not just “birds”. These are ducks. A swarm, a flock……a multitude of water fowl. More ducks than I have ever seen at one time. And they were in the trees too. All OVER the trees in fact. It was peculiar, and magical at the same time. I am not absolutely certain, but I believe they could be wood ducks on a migration from Canada. 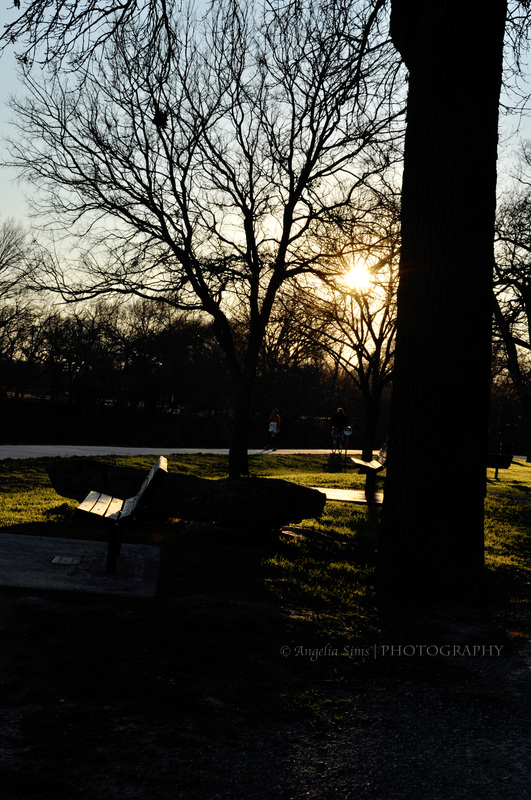 The photos were taken in January during our Texas winter (which is similar to Canada’s summertime). They were mostly brown in color with yellow/orange beaks. According to Texas wildlife, they could be whistling ducks (if they are native). Or it is possible they are mallards in the midst of molting. The mallard males can look like females when molting. I’m not a hunter of ducks, although I have Labrador Retriever (ha! ), but per the powers of Google, this was as close as I could guess. I might be completely wrong and they are some sort of brown Geese. It doesn’t really matter to me what they are, I just love nature. I love seeing unique opportunities like this against this beautiful Texas background. I am sure there is some reason why they chose this place to rest. Or Maybe, they were just exploring too. 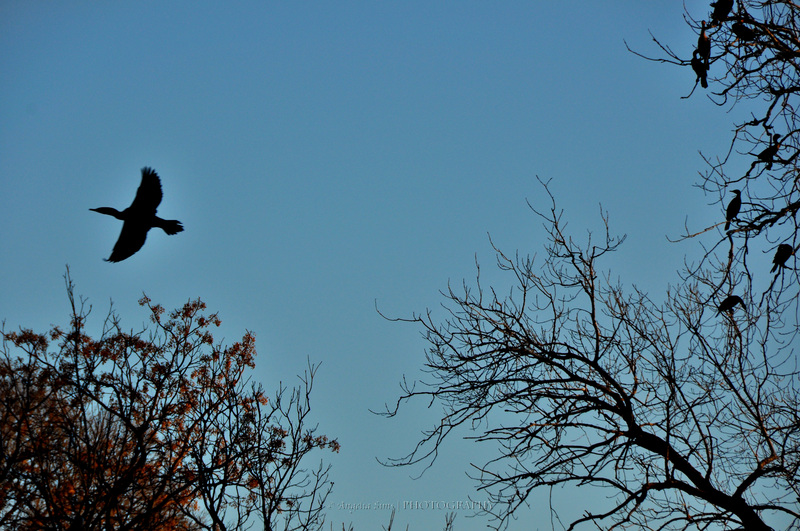 Check out other entries for silhouette here: The Daily Post Weekly Photo Challenge. Edit: The wonderful and talented Wildlife Photographer Phil Lanoue has helped me identify these wonderful creatures. 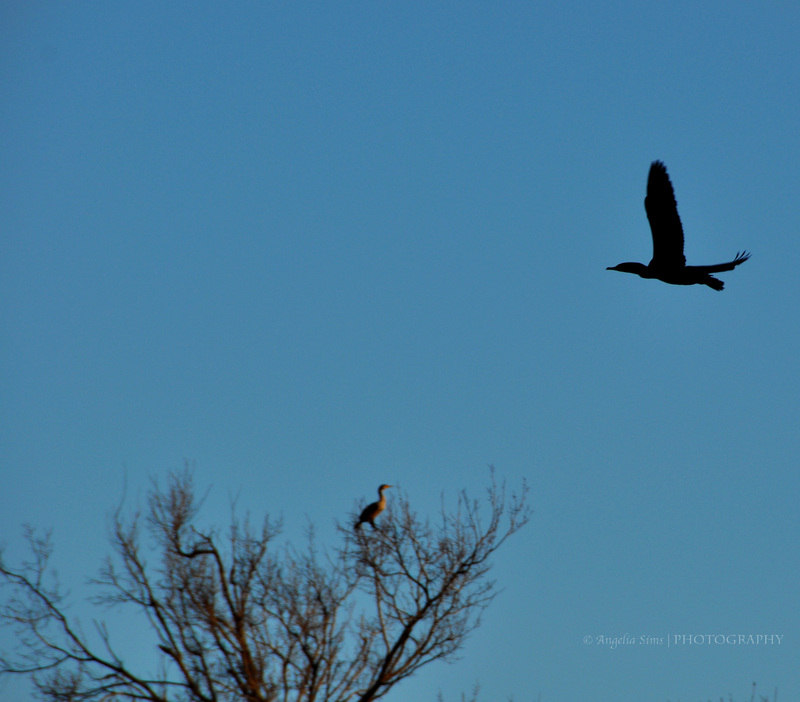 They are Cormorants, particularly double-crested Cormorants that winter in Texas from November to May. They are a water fowl that eats fish. I am thinking the fisherman of the Trinity were coming up short because of these fellas. Big thanks to Phil! The silhouette trees look angry scratching at sky in some sort of protest. Wood ducks really scary/halloweenish if crows or ravens. It always amazed to see ducks in trees. Thanks for sharing. I can honestly say, I have NEVER seen so many webbed feet perched on branches in my life. 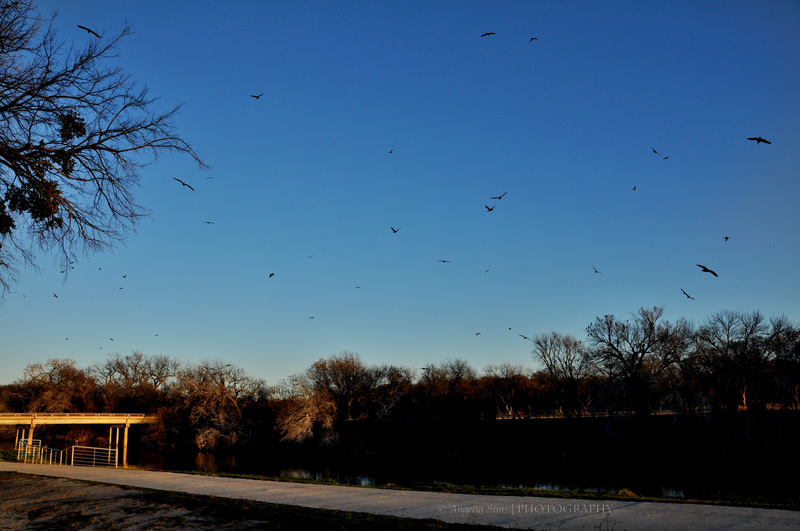 The birds in the trees and flying around look like Cormorants to me as best as I can tell. The cormorant is a water bird that fishes by swimming under the water and grabbing (not stabbing) a fish with it’s bill. 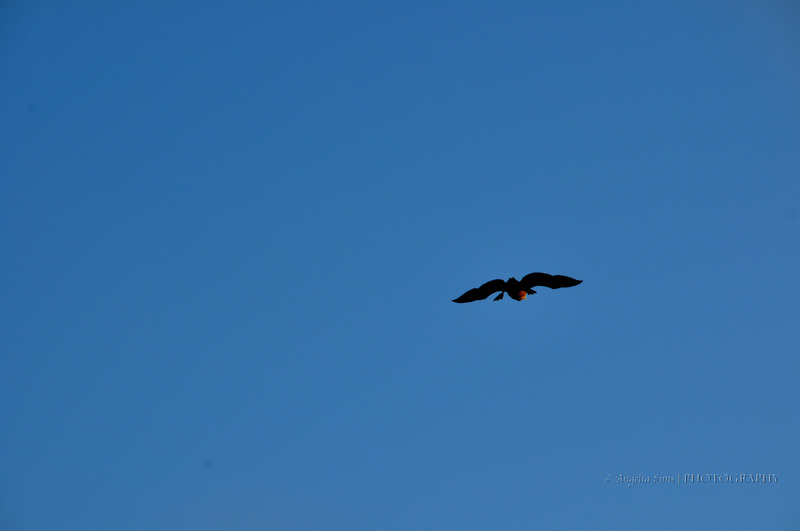 Check my blog and at the top, click on “Cormorant Photos” and see if that’s what your birds looked like. Great bird photos! All the photos are lovely, but I love the energy of the birds. Phil – I spent more time with Google and the non-silhouette photos. You are so right! 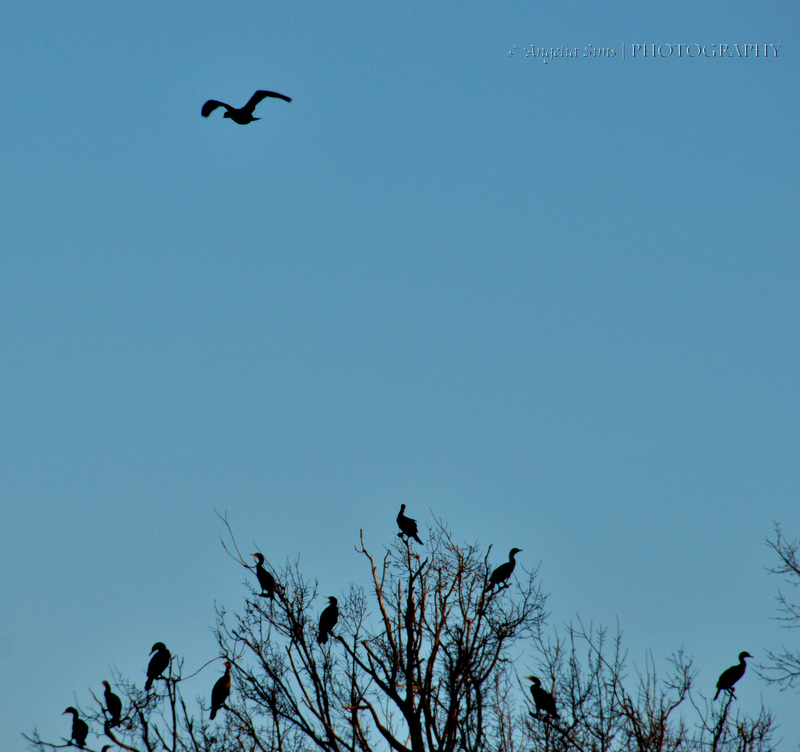 They are Cormorants. The Double-crested Cormorants are most common in Texas that time of year and match their markings. Thank-you so much! It’s really cool to learn this and get more familiar with wildlife (I have a long way to go!). Thanks Jordan! I think they do have an energy. It was really fascinating to watch. It is a lovely park. I find a lot of peace there. beautiful photos and the park looks amazingly peaceful. It really is a marvelous place to walk, run, or just mediate on the flow of the river. Really gorgeous year round. I’ve never seen ducks in trees before. How gorgeous! All of them are gorgeous. Such an amazing spot. You would love it. I went by your page today wondering how you are. Great to see you! I’m getting over some crummy blues. Trying to get back on track. I appreciate being missed, Angelia. Angelia, once again, your photos are STUNNING! That last one literally took my breath away! Perfection! I was willing to go with ducks, but then when Phill mentioned cormorants, realized the tails were not quite right for ducks. Another wonderful learning experience – all because of your beautiful photos. Beautiful! Birds are hard to photograph! I like how you used a series of photos leading up to the silhouette of the flying birds. Cormorants are the birds that are used for fishing, yes? They are like myths to me, because the fishermen put rings on their necks so they can’t swallow what they catch, but bring it to the fishermen. I think that’s how it works, anyway. I’ve been to Fort Worth, Texas!!! …for just a short bit. I did a little of humanitarian work there. 😀 Didn’t get to explore it much though.